The set of books on Mechanical Engineering and Solid Mechanics, of which this book is the first volume, is an essential tool for those looking to develop a rigorous knowledge of the discipline, whether students, professionals (in search of an approach to a problem they are dealing with), or anyone else interested. 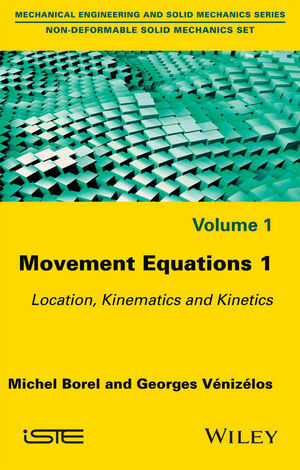 This volume deals with the elements required for establishing the equations of motion when dealing with solid bodies. Chapter 1 focuses on the systems of reference used to locate solid bodies relative to the observer, and demonstrates how to describe their position, orientation, and evolution during their motion. Chapter 2 introduces descriptors of motion such as velocity and acceleration, and develops the concept of torsor notation in relation to these descriptors. Finally, Chapter 3 concerns the notions of mass and inertia, as well as the kinetic torsor and dynamic torsor which consolidate the kinematic and kinetic aspects in a single concept. Michel Borel was previously a lecturer in mechanics at the CNAM Center in Versailles, Associate Professor at École nationale supérieure du pétrole et des moteurs (ENSPM), and an engineer for the company Bertin and at the General Armament Direction (DGA). Georges Vénizélos is Professor and Chair of mechanical systems design at Conservatoire National des Arts et Métiers (CNAM) in France. His research field concerns vibration control. mament Direction (DGA). 3. Kinetics of Solid Bodies. 1. Location of Solid Bodies. 3. Kinetics of Solid Bodies. 1. Location of Solid Bodies.